Bit of a curiosity, this dish. According to curry Guru Pat Chapman, in his brilliant book “The New Curry Bible”, its roots lie in the very early days of Anglo-Indian cuisine, the style of food that began to emerge as Indian cooks adjusted to the requirements of British tastes during the time of the Raj. Chapman traces the origins of the dish to the Captain’s table on the coastal vessels that were the quickest way to get around India before the arrival of the railways. Somewhat ironically, this dish is rarely seen on the menus of Indian restaurants in the UK, and yet it is apparently very popular in the Southern United States, supposedly having being taken there by the East Indian Company via the port of Savannah. FDR himself was partial to a serving of Country Captain, and he subsequently introduced it to none other than George S. Patton. So keen did Old Blood and Guts become on the dish, that in 2000 it was introduced into the US Army’s field rations in his honour. This, my Paleo version of Country Captain, is based on Pat Chapman’s, with the ghee and single cream of the original recipe replaced by coconut oil and coconut milk. As I was unable to track down the celery seeds needed for Chapman’s version, so I used a single stalk of finely chopped celery instead. The results were applauded by both Mrs. Paleovirtus and Paleovirtus Jr. In particular, they liked the fact that the dish had that creaminess and turmeric derived warmth that they love in Indian food, together with a mild but not overpowering chilli buzz. So, all in all another successful Paleoification of an Indian classic. Hurrah! Heat 2 tbsp of coconut oil over medium heat in a non-stick wok. Add the onion, and stir fry for about 5 minutes, until the onion has started to soften. Add the celery and peppers, and stir fry for a further 3 minutes. Add the chillies, and stir fry for a further 3 minutes. Add the garlic and turmeric, and continue to stir fry for a further 2 minutes. Add the chicken, and mix well. Continue to stir fry until the chicken has lost its raw colour, about 3 to 5 minutes or so. Add the cherry tomatoes and the coconut milk. Stir well, and bring up to a low simmer. Continue to simmer uncovered until the chicken is cooked through, 15 minutes should see you about right here. Serve, garnished and dressed with a splash of lemon juice and a sprinkling of the chopped fresh coriander, with cauliflower rice on the side. 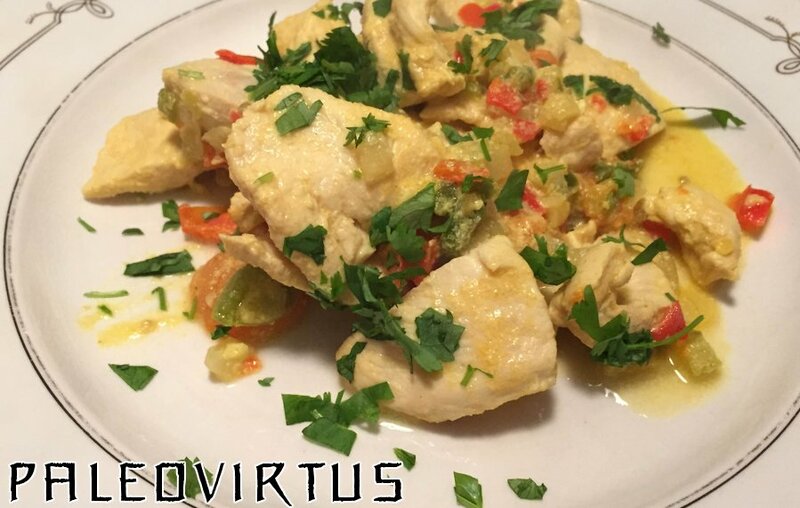 This entry was posted in Food Diary, Recipes and tagged chicken, coconut milk, coconut oil, Country Captain, curry, Indian, paleo, Raj, recipe on October 14, 2014 by paleovirtus.